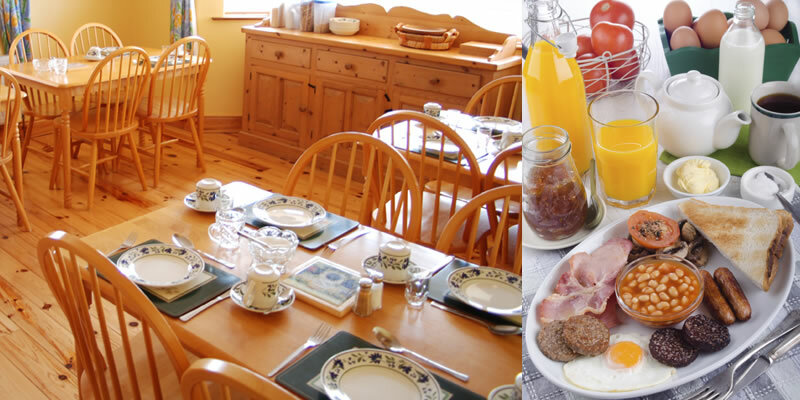 Whether you prefer a full Irish breakfast, we can cater for you at Lacken Lodge. Our Full Irish breakfast of bacon, sausage, black and white pudding, grilled tomato and egg – fried, poached or scrambled is delicious. We serve a selection of cereals: cornflakes, muesli, weetabix, bran flakes, crunchy homemade granola, and organic porridge oat flakes. Chilled fruit juices, fresh fruit and yogurt are on offer and our Vegetarian option includes boxty (traditional Irish potato pancake), grilled tomato, mushrooms, beans, and egg – fried, poached or scrambled. Other tasty items on the menu include Pan-fried kippers with herb butter, Organic smoked salmon with scrambled eggs on whole meal soda bread served with a selection of homemade breads, scones, toast and local preserves, accompanied with a beverage selection of freshly brewed tea, coffee and herbal teas. We can cater for special dietary needs; please let us know when you check in.